Meet Winchesterton the Third. He’s a Schnauzer dog. This doggy wasn’t always this dapper looking, though. He went through an awkward phase while his fur was growing and all the other puppies laughed at him – but more on that later. For now I’ll ask you kindly not to stare, point, or make any hilarious – er, I mean inappropriate– remarks about his abnormal hair growth. It would be insensitive, for example, to call him Spaghetti Snout, or Noodle Nose, and would probably him cry. Not that I would know, of course – I’m a nice person who definitely didn’t come up with those mean names. This is Part 1 of the pattern. This part will teach you how to make the dog’s body from start to finish, without any fur. Part 2 will be a tutorial on how to make and attach your very own handmade doggy fur, so keep an eye out for that! (Hit subscribe if you want an email notification!) UPDATE: Part 2 is live! Click here for Part 2. UPDATE: This pattern is now available in Dutch, too! Click here for the translated version. HOW CAN I POSSIBLY THANK YOU FOR THIS AMAZING PATTERN? Winchesterton III’s pattern is totes free – yes, this is your lucky day! So pay it forward by sharing it with all your crochet buddies, comment to let me know how much you love it and how it was worth my while to bestow such a generous freebie on the crochet populace! XD If you find that you like my pattern writing style, you can support my dream and feed your passion with my Premium Patterns! WHAT TYPE OF YARN SHOULD I USE? This is a very important point! You’ll be using some of the same yarn for your dog’s body and his fur, so make sure you start off with the right stuff! To make the fur, you’re going to be brushing the yarn out, so you need yarn that will turn fluffy when you brush it. So cotton or anything stringy wont work! If you unravel a thread of yarn and it separates into strings, it’s not going to turn into fur! You can test by brushing the very tip of a thread of yarn to see if it goes fluffy. Read “PATTERN DETAILS” below for more info on yarn weight and brand! YOUR CROCHETING IS SO NEAT! HOW DO YOU DO IT? Difficulty: Easy – Intermediate. The body itself is easy, but the fur presents more of a challenge. Necessary Skills: The magic ring, working in the round (in a spiral) and the crochet stitches listed below in abbreviations. The pattern with teach you how to make the fur in Part 2. Gauge: Not critical with amigurumi. Using the suggested hook and yarn combo will make a dog about 25cm tall. Your tension should be tight enough to conceal the stuffing inside. Note: The dog’s entire body is inside-out! Turn all pieces inside-out before stuffing them. If you’re doing Invisible Decreases, make sure they’re also inside-out! Start stuffing the body firmly, and continue stuffing as you go. Tie off, leaving a long thread for sewing body to head. Those rather silly looking tentacles around his nose? I put them there before attaching my safety nose because I was worried the nose’s backing would get in the way later and I wouldn’t be able to get my hook in there to attach fur. Turns out, it was unnecessary, so you don’t have to do it. We’ll get to the fur later, and for now we’ll politely ignore this incredibly silly snout. Attach the safety eyes and nose now. Eyes: Position them on the face between R20-21. Leave 16sts open between the holes where the eyes are inserted. Nose: Place it in the center of the face between R5-6. Start stuffing the head and continue stuffing as you go. Tie off and sew closed. Tie off, leaving a long thread for sewing the leg closed and attaching it to the body. Stuff the leg firmly until it is half full. Continue stuffing less firmly to taper the leg off as you fill it up, ending with almost no stuffing at the opening. R11: SC 2 sts together. Tie off. SC around the edge of the ear: Starting at the 1st ch, insert hook and join yarn with a SS. Work the tail in as you proceed. SC in same st. Crocheting evenly into the free edge of the ear, work 12 SC up the side. Once you reach the tip (R11), work 2SC into the st. Crocheting evenly into the free edge again, work 12 SC down the other side of the ear. Leave the 3rd free edge un-worked. Tie off, leaving a long thread for sewing ear to head. Make 2 ears the same. Well done – you’ve finished making all the pieces! Time to start assembling everything…. Note that the limbs and head don’t need to be sewn in the exact same position as stated below. Try pinning your dog together and adjust the features according the the type of character you want to create. Start with the front legs. Position them on the body at roughly a 45 degree angle between R25-31. Between the highest points, leave 6 sts open across the chest, between the legs. Sew the legs in place along the edge that you previously sewed closed. Sit the body up, allowing the front legs to support it as they will when the dog is finished. This will help you position the back legs. They should be flush with the ground. Place them on either side of the body, with the ends aligned with the center of the body and spanning across R7-15. At the highest points there should be 23 sts between the legs, across the dog’s back; and 22 sts between the lowest points. Sew the legs in place along the edge that you previously sewed closed. Then, sew the last 5 Rounds of the leg to the body as well, along the fold line created. Count 12 Rs from the back of the head, and pin the opening of the back of the neck here. Count 14 Rs from the front of the head, and pin the opening of the front of the neck here. Pin all around evenly, checking that the head is facing the desired direction, then sew in place. Position the ears at R11 (counting from the back of the head). Leave a gap of 7 sts open between them. Lay the ears flat on the head, pointing towards the back of the head as pictured (without giggling at his abnormal hair growth), and then sew along the free edge where your starting chain is, to attach them. They can now be posed as desired. Attach across R4-9, in the center of the body. Congratulations – your pup has a finished body! Let’s get together again next Monday for the exciting FUR TUTORIAL! Edit: Part 2 is now live! Click here. I would love to see how your dapper doggies come out – tag me @Projectarian with your #WinchestertonTheThird photos, or post a pic in our little Facebook group! Remember to share this post with your fellow crocheters, and subscribe so you don’t miss out on future Projects! PS. Please let me know if you spot any mistakes so I can fix them! You may only share ONE image of the dog from this post. Click the Maker’s badge to find out what crafty goodness is in store for you here! Hey Jessie! The pattern is in the very post you’re commenting on! 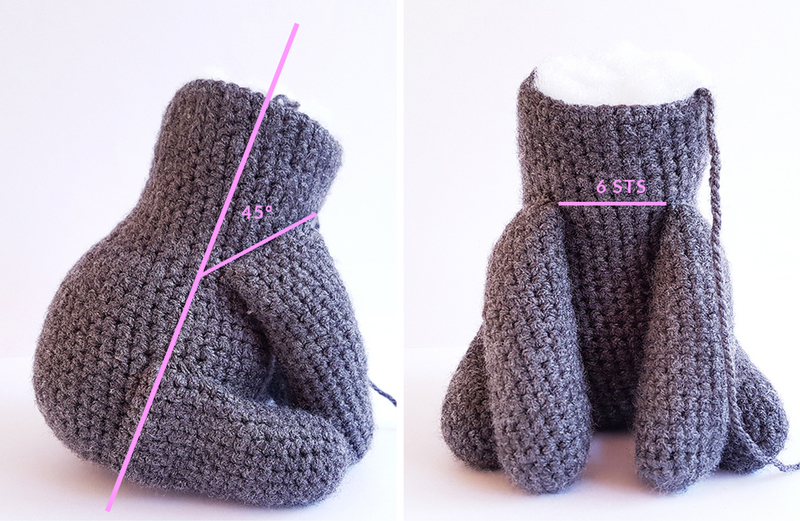 It’s starts with an Intro, then you scroll down to find out what you’ll need to make it, then scroll down further for the instructions on crocheting the dog. Is there a PDF file? Or a printable page for this? First time that I will try an amigurumi. But this little one looks like my dog sitter’s dog and this lady is always there for me when needed. So it will be a nice little thank you present for her. It’s my pleasure, Karen. Let me know how it goes! I am confused as to why you would turn your work inside out? Thank you. Is your yarn a 4 ply? Or can you give brand names used? He is do darn adorable I cannot wait to start!! The yarn is Double Knit (Light Worsted / 8ply/ 11wpi) – you can find that, and more info under “PATTERN DETAILS” in the post. 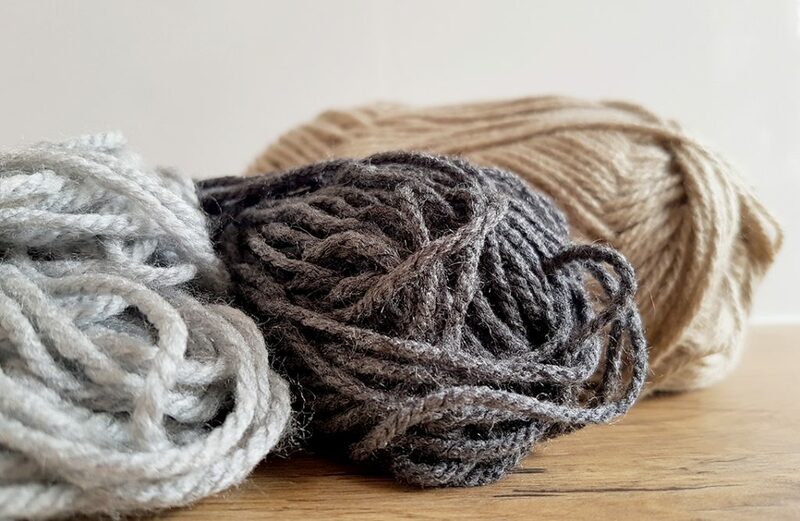 I used a South African brand of yarn called Charity, that’s why I specifically do not mention the brand (I know most readers aren’t in SA), and rather describe the type of yarn you should use. 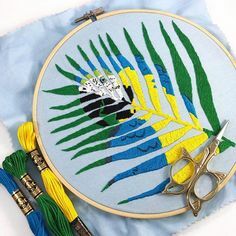 Hi there – just came across this pattern the other day and can’t wait to start it. 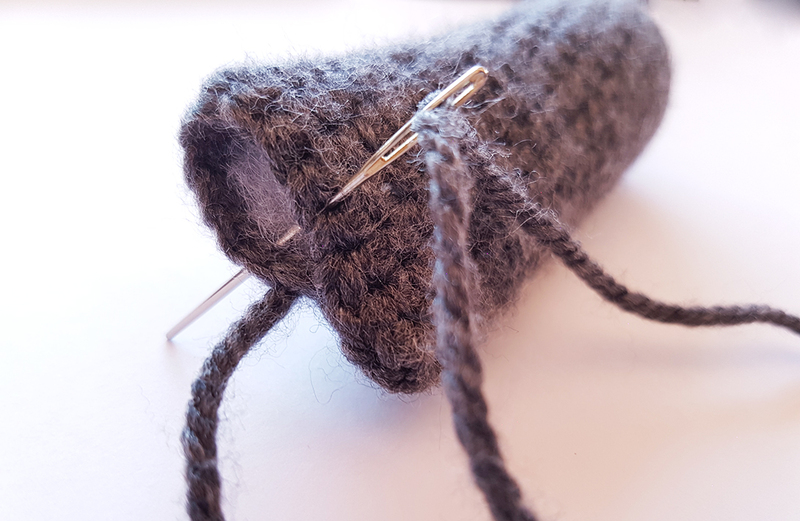 I do have one question – if you are supposed to turn the work inside out after crocheting – how does that work when on the body and head you start stuffing before you are done with that particular piece? Any help would be appreciated. Thanks! OMG!! He is sooooo cute and lifelike. He looks very much like my little guy. I just love this puppy and cannot wait for part 2 to come out. Is there a way to print this pattern ? Wow! It looks grate! What size are the eyes? I’ve updated the pattern now with that info. Ayala, I’m so embarrassed! I gave you the wrong eye size – I’m so sorry! They’re supposed to be 21mm, NOT 18mm! It’s not the end of the world if you use the 18mm ones though. I picked up the error when I saw a reader’s dog in progress and the eyes looked smaller – BUT! – the dog still looked really cute and at first I wasn’t even sure they were the wrong ones. Anyway, sorry about that. Mistakes do happen, unfortunately. I am not able to do this,but would be interested in buying one just like the original! Hi John, I’ve sent you an email regarding having one made for you! Hey Christine 🙂 My customer’s schnauzer was in these colours, so that’s the only reason I used them. I know I’d really like to see some different colour combinations, so please use whatever colours your heart desires for your special customized doggy! You can easily substitute the Beige with Silver on your dog. You should definitely give it a go, Christine! This particular doggie is crocheted with a double knit acrylic yarn – it doesn’t have to specifically be wool. A yarn made of blended acrylic and wool can work too. Me encanta. Es como un tipo de perro yorkshire?? Como se hace para ponerle el pelo?? Thank you for the neat pattern. He is so cute. You’re welcome Bert 🙂 I’m glad you like him! About how big is the finished project. Too darn cute! Thanks Linda, I’m glad you like him! The finished pup is 25 cm tall. First, thank you for the excellent pattern. While making him I couldn’t help noticing that you have a small typo in Round 39 of the body. You’ve dropped from 21 sts to 14 sts with the instruction “sc2tog around”. I’m guessing you meant “(sc in next st, sc2tog) around”? I’m glad you enjoyed the pattern – it’s my pleasure! Thank you for pointing it out that mistake, I appreciate you taking the time to help! I’m sure your schnauzer will appreciate the tribute 😀 Thanks Florencia! I love this I am the proud owner of two of these little dogs – I will be trying to do this as they look one pale grey and white the other deep charcoal and white – if it works I will try to send a photo. Thank you for the chance to get a pattern that will allow me to do this. I’m so proud of my first amigurumi, especially since i can’t even pronounce it! Your instructions are perfect and this is so stinkin” cute i just had to attempt it. I’m more of a scarf, cowl, dishcloth sort of gal so this was a real stretch for me. I am in southern California and made this for a Canadian friend. Just thought you’d like to know how far your generosity traveled. I have pictures but am not sure how to get them to you. I will try facebook. Just finished my dog and I love it. Your tutorial is great and easy to follow. Thank you! Or on Instagram @Projectarian, with the #WhichestertonTheThird tag. If you don’t use either of those platforms, you can always email me a picture at Hello@Projectarian.com. Thanks Cathy – I can’t wait to see! Hi. I haven’t started making this adorable schnauzer yet, but can you tell me how big he is? You’ll find his size and any other information you might need under “Crochet Pattern Information” in this post. Problem is I can’t frind the heading ‘Crochet Pattern Information’ – where is it? Thank you for such a well written and photographed tutorial. I’ve made two schnauzer’s now and am delighted how they’ve turned out. I would love to post a photo of them but I’m not sure how to. 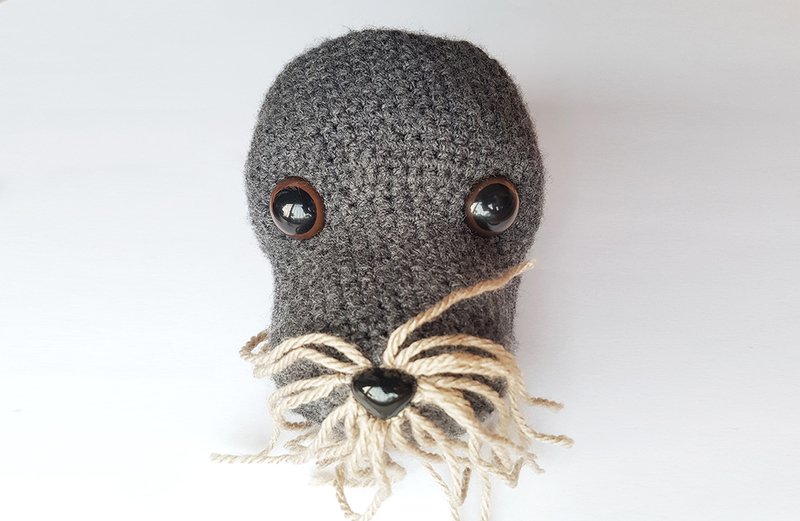 What a terrific little dog, I am reasonably new to amigurumi but would live to make this, can you tell me when and how you attach the safety eyes etc, and does it need something to reinforce at the back of the crochet. I’m glad you like the pup, Barbara! 🙂 The eyes and nose should be attached just before you start stuffing the head – while there’s still space to get your hands inside the head. Safety eyes and noses come with a stopper that you push onto the back when you attach them (like an earring with a butterfly). The stopper locks in place and wont come off, making them safe. Hello Jessie, I was just wondering there did you get your safety nose from. Hello. I was wondering where did you get the safety nose from? Hey Sarah! I got mine from a yarn shop. I always find them in any fabric/yarn/craft shop or haberdashery that has sells buttons (they’re usually kept in the same section as buttons). You can also order them online from sites like ebay. I hope that helps! Thankyou very much for this pattern…. Just love him, fantastic job I will give it a go. Thank you! I really love this project and I’ m going to try it as soon as possible! Thanks again, greetings from Italy ? Hello Alessandra all the way in Italy! I’m very happy to hear you like the project and I hope you enjoy making your own little dog! I love him, I made him – THANKYOU for the fantastic pattern & descriptions & photo’s..
Ceren, your doggie came out really cute! You did a great job and I love how his hair came out all curly! Thanks for sharing your picture. I’m so glad you enjoyed the tutorial. Hugs back! Your pup turned out so Cute! Great job!!! I am very new to crochet and had only made a granny square blanket and a snuggle sack before seeing your excellent tutorial. 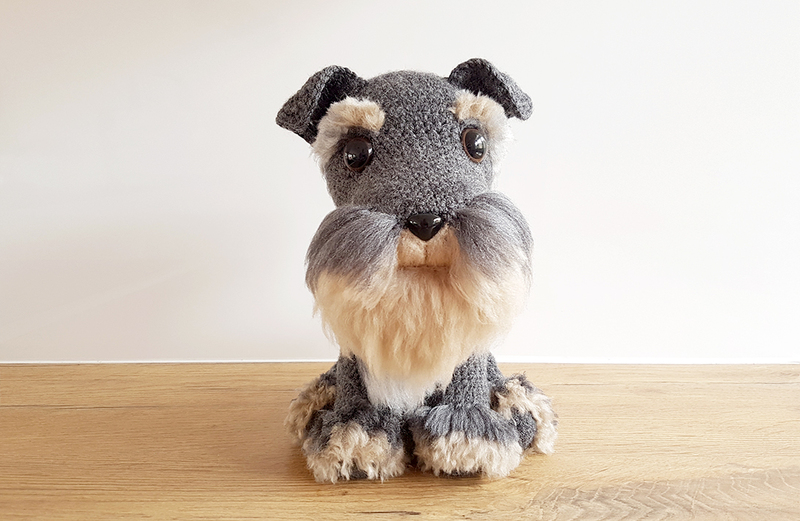 I made my schnauzer and am very pleased with the result. I posted a photo to a facebook page that I follow and I am amazed at the response (3.5k likes so far!) Many people asked for the pattern, which I have shared. Thank you so much for making this project so easy with your detailed instructions and photos. Loved this pattern. Had fun doing it. Just finished the body and want to start the fur but… I am concerned about the size of the project and will it actually stand up. The head seems large. Can you tell what the approximate dimensions should be for each body part. Sorry Louise, I didn’t measure the body parts. The head is disproportionately large (compared to a real dog) and is almost the same size as the body. The finished size of the dog is about 25 cm tall, if that helps at all with your estimations. The dog won’t stand up, as it is designed in a sitting position, and it will definitely sit up if the pieces are positioned correctly. Pin all the pieces in position before you sew the dog together, and adjust the limbs to support the body. I hope that helps! I hope it works out! Let me know? Thank you for sharing your wonderful pattern free with the great photos. I should be able to turn this into a Scottie with black, very dark brown and very dark grey yarn. This is a terrific design. Thank You for sharing your wonderful pattern with great photos for free. I should be able to turn this into a Scottie with black, very dark brown & very dark grey yarn. This is a terrific design. My pleasure, Kim 🙂 A Scottie sounds like such a cute idea! I’m sure it will come out great! It’s so beautyfull, oh! I love it, it looks just like my dog. I will make it! I’m so glad you like it Miranda, and I hope you enjoy making a little look-alike of your dog! Oh my god, this is so cute! Thank you so much for this pattern. I plan to make this for my dad. His buddy (and my first ever pet), a miniature Schnauzer, passed away from old age a fee months ago, and I know my dad misses him. I think this would be a nice present for him. I am so impressed with this pattern! I’m almost ashamed to tell you I was so eager to make a Schnauzer for my youngest sister that I purchased a pattern. It’s not anywhere near as detailed or helpful​ as your pattern!! So, thanks bunches!! I definitely will be looking at your premium patterns when payday gets here. I do have one question… What is the reason for turning the body parts inside out? This is the first amigurumi pattern I’ve seen that has that instruction… so I’m curious. Thanks for getting in touch Bobbie 🙂 I’m so happy to hear you like the pattern (sorry the one you purchased wasn’t so great!) and I’d be honoured to have you take a look at the Premium collection! Hugs to you Jessie ? I am having so much fun trying this. My friends say it will take a miracle worker to make a dog from the pictures of the pieces I have completed so far….lol. I am hoping to really surprise them. I am having a blast making it and I think that is part of the fun. I finished this for a friend who just lost his Schnauzer. I’m sure that will make your friend very happy 🙂 I’m glad you found the pattern useful! Could someone let me have the height and width and length of this gorgeous little creature. I want to upsize him to door-stopper size, please? 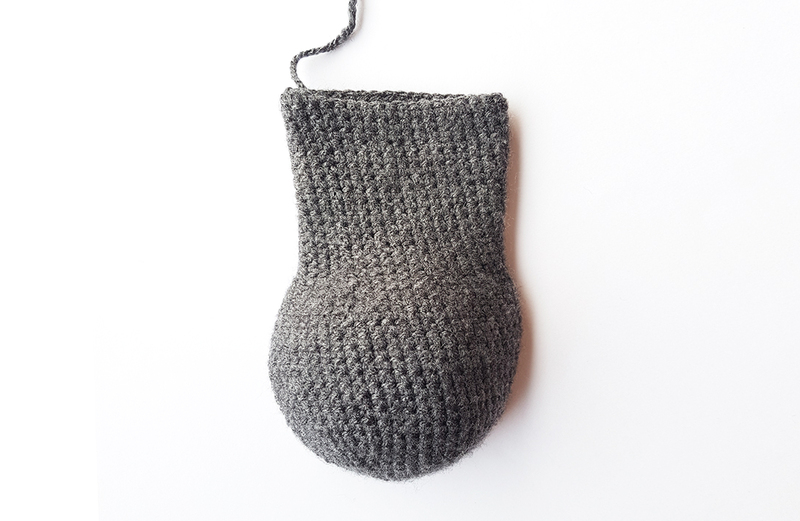 The dog will be about 25 cm tall, using the hook and yarn combination listed in the pattern 🙂 Good luck with your door-stopper – interesting idea! Mine looks a little bit mor lokr a mouse, but its a qutie 🙂 is it possibul to ad a picture? Hey Ayala. I’m glad you found the pattern useful and I’m sure your son loves his mouse-dog! 😉 At the end of this post there’s info on how to share a picture with us. Can’t wait to see! This pattern is amazing! Thank you so much! 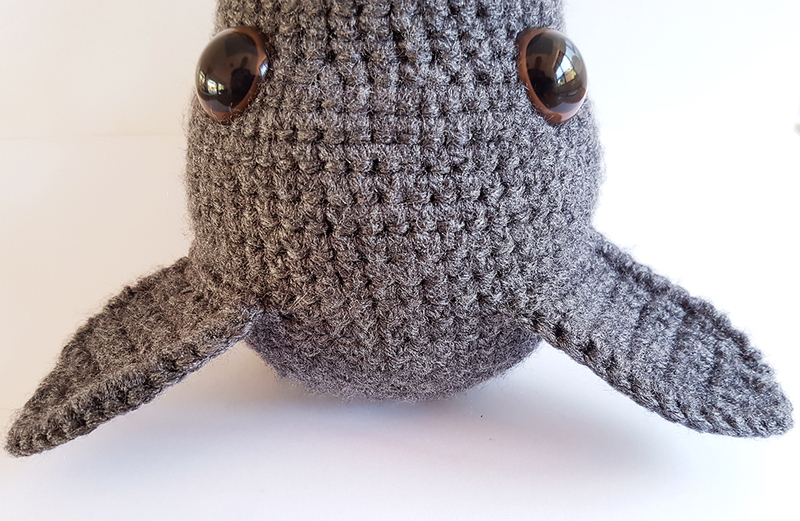 I’m quite new to amigurumi and I found your pattern very easy to follow with clear instructions. I made black on for my friend who has just got a Schnauzer pup. I Can’t wait to try some of your other patterns. I’m so glad you enjoyed it and happy to hear that it was easy enough for a newbie to follow! Thanks for getting in touch, and please do try some of the other patterns! Have you ever though of, or can you make a pattern for knitted schnauzers? I just love the crocheted one but it’s a skill I have never mastered I’m afraid.